"All mankind lives and strives by the code of conduct, mutually agreed." Why Code of Conduct ? You know that your employees cannot take valuable gifts from the organization's business associates. However, do they know there is actually a threshold value defined by your company? The very reason for code of conduct is that it clearly defines what is acceptable and what is not, in terms of its employee's conduct and behavior in the organization. It may include your industry partners as well. Why Code of Conduct Awareness ? You have the code of conduct, or the 'Ten Commandments' of your organization in place. Providing information is NOT the same as awareness. Awareness results in understanding, which in turn results in better judgment. People don't move around with a code of conduct manual referring to it every time a situation presents itself. The very idea of this entire exercise is to make employees judge the situation and take an appropriate action. At times, a good judgment can result in amending the original guideline itself, which makes it a cognitive process. This is what awareness tends to achieve. As a Buddhist quote says, "To know something, and not have it change your life and consciousness, is to not really know it!" Why Zobble for Code of Conduct Awareness Course ? That's where we get into the picture. We analyze the content, design different scenarios, and create an engaging learning experience. After our diligent research, we present the content in a way that maximizes retention value, thus helping your employees to recall and apply the guidelines when confronted with any tricky situations in real life. You can be sure to get a highly customized and relevant course on Code of Conduct from us. 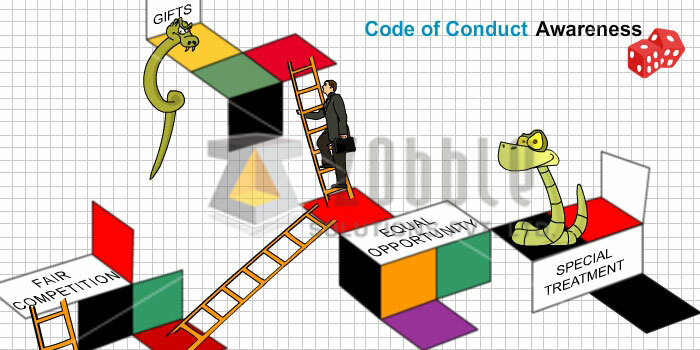 We at Zobble, DECODE the CODE of CONDUCT so as to enable YOU to ENCODE it into your organization's DNA. Here are some of the screen shots of our earlier endeavor. Creating scenarios, based on the real-life situations and presenting them interestingly and interactively. Enhancing the recall value of key words associated with the code of conduct elements through game-based knowledge checks. Identifying critical real life situations where compliance to code of conduct may be violated and presenting them in a visual story format. Click here for an online demo for a scenario based Code of Conduct Course. Want to know more about Zobble Solutions Pvt. Ltd.? click here to request our portfolio.